DC Moore Gallery is pleased to present Guide, a solo-exhibition of new paintings by Eric Aho. Aho is known for his landscapes that abstract the natural world, and this new body of work, at times both inviting and confrontational, challenges our understanding of depth in a uniquely painterly manner. Many of the works are large in scale, in order to examine the dichotomy of monstrousness and intimacy that can be found in the deep and complicated architecture of the forest. In “River Guide,” Aho has created a minimalistic river scene, yet the inclusion of a simple horizon line defines the overpowering size of the trees that merge with river. It is frontal, daunting, but simultaneously calming due to the gentle light breaking through the trees and the delicate trace of fishing casting lines that also signify a real and personal experience the artist had there. Other works elevate the imaginative, primal nature of the forest by transforming it into patterns of vibrant, expressive color. “Walker’s Woods” elevates the diverse palette of nature’s brighter hues while the deep blues and grays in “Pinewood Nocturne” evoke the terrifying mystery and magnificence of the dense forest at night. Aho constructs his paintings around the notion that we can access feelings of pain and beauty through the sensation of awe in being unable to control nature. Through his deft use of enveloping strokes of thick paint that materialize these liminal settings, he has created works that allow the viewer to recall one’s own spiritual encounters in nature. The paintings therefore conjure a feeling of an escape, both contemplative and meditative. In this way, Aho’s landscapes are a necessary and regenerative antidote from the chaotic cultural climate we find ourselves immersed in every day. A catalogue with essay by Peter Heller, nature writer and author of Celine, and The Painter will accompany this exhibition. To view online please click here. 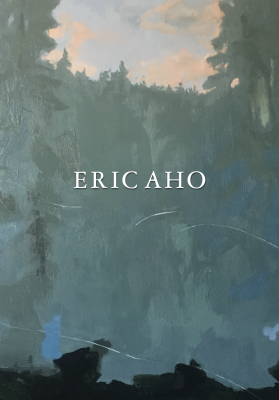 Eric Aho lives and works in Saxtons River, VT. After studying at the Central School of Art and Design in London, Aho received his BFA, and in 1989 participated in the first exchange of scholars between the U.S. and Cuba in over thirty years. Aho completed his graduate work at the Lahti Art Institute in Finland, supported by a Fulbright Fellowship, in 1991-92 and an American-Scandinavian Foundation grant in 1993. His works have recently been exhibited in; “Transcending Nature: Paintings by Eric Aho,” at The Currier Museum of Art, NH; “Eric Aho: Ice Cuts,” at The Hood Museum of Art, NH; “Eric Aho: An Unfinished Point in a Vast Surrounding,” at The New Britain Museum of American Art, CT. His works are collected widely in the United States and abroad and are included in the permanent collections of the Currier Museum of Art, NH; The Denver Art Museum, CO; The Fine Arts Museums of San Francisco, CA; The Hood Museum of Art, NH; The Metropolitan Museum of Art, NY; The Museum of Fine Arts, MA; The New Britain Museum of American Art, CT, among others. Fine Art Globe: Eric Aho's "Guide"